Boston 1775: Swearing into Office "So Help Me God"
John Adams Perceives "Obloquy Enough"
John Adams's Tale of the "Irish Infant"
Swearing into Office "So Help Me God"
Was the Provincial Congress Illegal? What Was Massachusetts's Government in 1775? Did William Dawes Do More than Paul Revere? 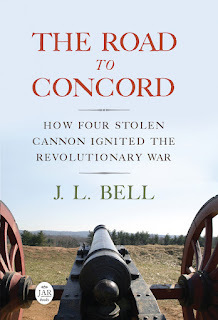 The Lasting Impact of Longfellow's "Revere"
Where Was the "Shot Heard Round the World"? This week, the H-OIEAHC email list had a discussion, prompted by a query from historians at the Smithsonian Institution, about when and how presidents started to end their oath of office with the phrase "so help me God." This weighty question is, of course, a stalking-horse in the U.S. of A. 's ongoing debate about protecting church from state and vice versa. 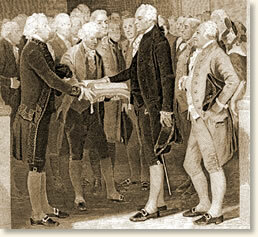 A tradition has grown up that George Washington added "So help me God" after he took the oath. The Library of Congress's website on presidential inaugurations says so, but without a source. And as of yesterday no one on the email list had found contemporaneous evidence to back up that statement. The count wrote in French, which explains the variation in wording from the Constitution's language. The Vice-President rose and addressed a short sentence to him. The import of it was that he should now take the oath of office as President. He seemed to have forgot half what he was to say, for he made a dead pause and stood for some time, to appearance, in a vacant mood. . . . [Washington] was agitated and embarrassed more than ever he was by the leveled cannon or pointed musket. He trembled, and several times could scarce make out to read, though it must be supposed he had often read it before. He put part of the fingers of his left hand into the side of what I think the tailors call the fall of the breeches, changing the paper into his left hand. After some time he then did the same with some of the fingers of his right hand. When he came to the words all the world, he made a flourish with his right hand, which left rather an ungainly impression. Maclay was either too distracted by the president's hands to record his oath (or keep the hands straight), or he didn't think the recitation of the oath was worth recording. The same webpage says Livingston hadn't thought to bring a bible, so someone had to run to the nearby Masonic lodge to fetch one—a detail that doesn't indicate officials had the religious aspects of the ceremony uppermost on their mind. That the form of the oath to be taken by the members of this Houses, as required by the third clause of the sixth article of the Constitution of Government of the United States, be as followeth, to wit: "I, A B a Representative of the United States in the Congress thereof, do solemnly swear (or affirm, as the case may be) in the presence of Almighty GOD, that I will support the Constitution of the United States. So help me GOD." I, A. B. do solemnly swear or affirm (as the case may be) that I will support the Constitution of the United States. On 3 June, Vice President Adams and members of the Senate took time to administer this oath to each other. The Government Printing Office says, "The oath was revised during the Civil War, when members of Congress were concerned about traitors." The current Vice-Presidential oath, says the Senate's website, made its appearance in 1884. It now officially ends with "So help me God"—but of course that wasn't the full Congress's "original intent" in 1789.